We do sell this as a kit, too! Make this Easter more colorful! 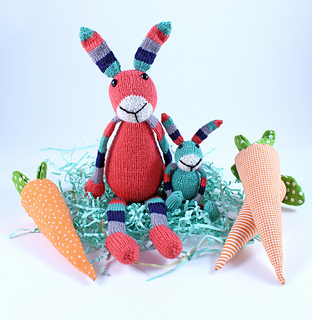 This knitting pattern makes a big bunny, a little bunny, and 3 Easter eggs, all complete with colorful stripes! 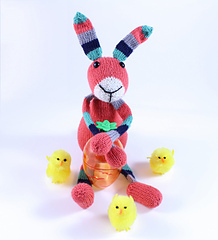 This is a great Easter treat to knit for your family and friends as a holiday gift. 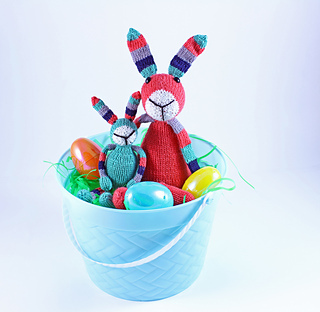 Keep your candy consumption down this Easter by knitting treats for your loved ones: All the sweet with no sugar (or candy consuming guilt!). This pattern was written by Rebecca Danger for Wicked Chickens Yarn. 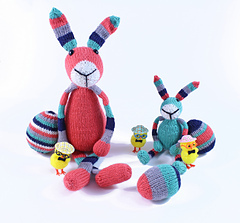 Rebecca is a prolific knitting pattern designer and author with more than 150 published designs. 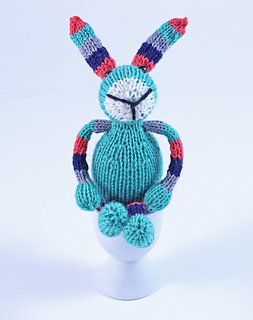 She is known for her whimsical monster and creature patterns, making her the perfect fit to design some Wickedly Colorful Easter Bunnies for us! Skill Level: Intermediate as determined by the Craft Yarn Council. We would recommend this pattern for beginning knitters that are comfortable knitting in the round or who want a bit of a challenge. We have rated it “intermediate” because according to the Craft Council skill level guidelines, anything knitted in the round is intermediate. 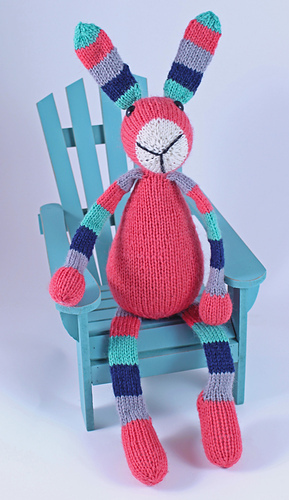 Skills used: Basic knit and purl stitches, changing colors, increases, decreases, knitting in the round, picking up stitches, holding live stitches and coming back to them later, and basic sewing skills. The heavier the yarn weight, the more yardage needed. 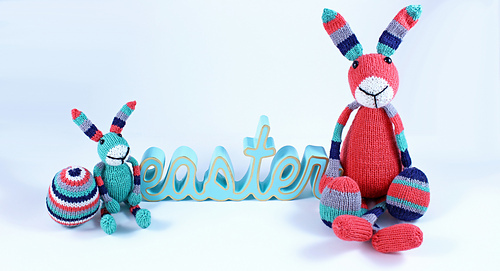 This pattern is written round by round so that you can use any weight yarn you want to create all sorts of sizes of Easter friends. 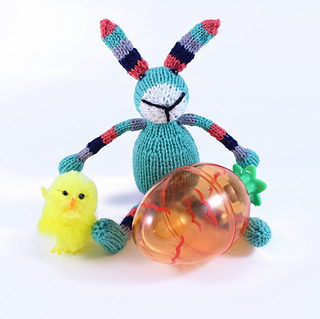 Try sock yarn for perfect Easter basket friends, or bulky for a really big bunny! Want this to be a pre-packaged, ready-to-go project? We can make that happen! We also sell this pattern as a kit in our shop. Gauge: You pick! Simply knit with your choice of yarn on needles 2-3 sizes smaller than called for to get a tight knit fabric your stuffing wont show through. Needles: You pick! A 40” or longer circular needle (for Magic Loop Method) in a size right for your yarn. See the pattern for more info. Notions: Scissors, tapestry needle, beginning of the round stitch marker (removable or closed) and optional row counter. Removable stitch markers: 12 for the big bunny and 10 for the little bunny. Stuffing and 2 sets of safety eyes, one small, one large (or other eye choice such as buttons or scrap yarn for embroidery). Finished size: Your finished size will depend on what weight yarn you use. 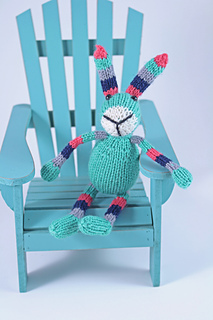 If you are knitting this pattern in sock weight yarn as shown in the samples, your big bunny will be about 15” tall from ears to toes with 9mm safety eyes. Your little bunny will be approximately 7” tall with 6mm safety eyes. The little egg with be about 2.5” tall and the large egg will be about 3” tall finished. Increasing the weight of your yarn, or even holding yarn double and working the pattern on larger needles will create larger finished friends. 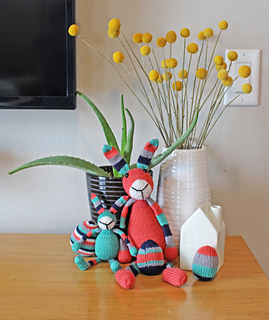 Talk about instant gratification, you can get started knitting this pattern right away! This is an INSTANT DOWNLOAD! You will receive this pattern through the etsy instant download system. Selling patterns provides income for our families. We know it is easy to share patterns, but please ask your friends to purchase the pattern from us. This pattern is copyright Wicked Chickens Yarn. 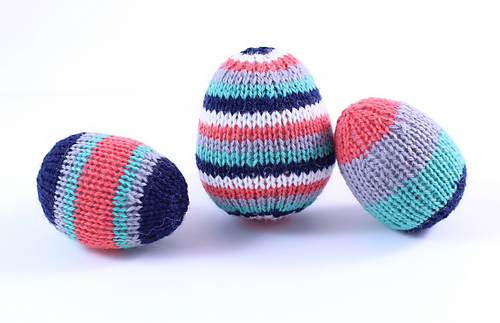 If you would like to sell finished items using these instructions, we are OK with that as long as you let your customers know the pattern used is from Wicked Chickens Yarn. 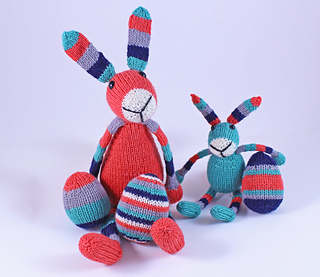 Check out our online shop for kit versions of this pattern!